Frigidaire 20 SEER, 81% AFUE iQ Drive® Gas/Electric Packaged Unit Reducing Corrosion:iQ Drive: Inverter driven Samsung rotary compressor provides five capacities in modulating operation from a two stage thermostat. • Interface control board: Two digit LED provides system operation, status and diagnostic troubleshooting information. Utilizesa NORDYNE-patented capacity control algorithm to select the optimum system capacity level. Internal controls monitor system operation to protect the inverter drive and compressor. • Cooling operation temperature range: 50 °F to 125 °F • Five Minute Restart Time Delay: keeps the unit from restarting, eliminating the highest cause for compressor failure. • EXV control: Precise refrigerant super heat control provided by an electronic expansion valve. • Suction Accumulator: Protection from liquid flood back and future compressor failures. • Compressor and Component Access: Designed to make servicing easier for the contractor, hinge access panel is provided to all controls and the compressor. • High Efficiency with low Sound Levels: 20 SEER with sound ratings from 63 to 74 db depending upon operating conditions. Engineered to significantly reduce unwanted noise with compressor sound blanket, variable speed condenser motor and swept-wing fan blade and discharge muffler. • High Pressure Switch :Protects against abnormally high system pressures. Auto-reset feature prevents nuisance service visits. • Low Pressure Switch: Protects against loss of system refrigerant charge. • Liquid Line Filter Drier: Factory installed. • Micro-Channel Condenser Coils: Allaluminum coils that provide high corrosion resistance and increased heat transfer. • Anteater Copper Tube (Luvata Uniguard) / Aluminum Fin Indoor Coils: Indoor coils are designed to optimize heat transfer, and increase durability and reliability. • Wire Guard Coated with Earth Friendly Epoxy and Plastic Mesh Hail Guard: A guard that will never rust and protects the units coil from being damaged. • Designed using galvanized steel: with a polyester urethane coat finish.The 950 hour salt spray finish resists corrosion 50% better than comparable units. • Heavy-Gauge Full Perimeter Base Rails: Facilitates forklift handling and curb mounting. • Convertible Air Delivery :Horizontal or down flow to accommodate rooftop or horizontal applications. • Corrosion-Resistant Drain Pan: Quickly drains away evaporator condensate. • One Piece Top for Great Fit and Finish, Total Seal: Well designed, quality construction. Drip edge on top panels whisks away rainwater.Embossed bottom pan keeps blower component compartment dry. • Smart Lite® Control Board: Provides extended life to igniters using hot surface ignition technology. Programmed to learn the heat-up characteristics of the igniter, then adapt the ignition time to the characteristics of the furnace so the igniter is energized appropriately. • Hot Surface igniter: Innovative application of an appliance type igniter with a 20 year history of reliability. • Energy Efficient Variable Speed ECM Blower:Advanced motor technology provides 16 field select able cooling and 8 for heating. Extra quiet and smooth blower on and off cycles, automatically adjusts to different static loads The iQ Drive gas/electric packaged system features modulating compressor technology and variable speed indoor and outdoor fan motors. This system is controlled from a two stage cooling and heating thermostat. The system has the capability of adding up to 18% of additional cooling above the rated capacity. The system has dehumidification capabilities from a capable thermostat or duct mounted humidistat. These packaged gas/electrics are ultra-high efficient self-contained heating and cooling units that can be installed on the roof or on a slab. The convertible unit design makes installations simple in all applications. Units are ETL and ETLc listed. Both coils in Frigidaire packaged units are manufactured to better fight problems with corrosion.Innovative: Frigidaire iQ Drive gas packs operate efficiently due to innovative iQ Drive technology. 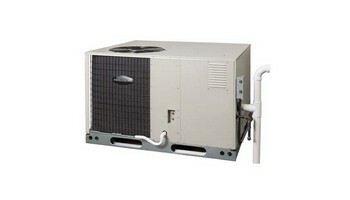 This unit includes inverter-rotary technology to exactly offset the cooling demands of a home. It modulates from 40% to 118% of capacity in five steps, making constant, small adjustments. This operation is what makes the unit so efficient and quiet. This model is the most cooling efficient gas pack available at 20 SEER and is the only one that operates this quietly .Quiet iQ Drive Units:With this gas pack, you can enjoy low sound levels – an excellent perk of choosing an iQ Drive unit Environmentally Friendly: This system is at the top tier of efficiency and comfort. It qualifies for the eco Logic® green seal – the highest measure of HVAC quality .All-Weather Protection: Both the wire coil guard coated with earth-friendly epoxy and a never-rust mesh hail guard protect the coil from being damaged by balls, lawnmowers, hail and more.ENERGY STAR Rated for Efficiency: Certain sizes of this unit go above and beyond benchmarks for efficiency and exceed ENERGY STAR requirements. Highest Assured Quality: Factory checked 72 times before being shipped. For industry-leading cooling efficiency when it comes to gas packs, choose the iQ Drive, R6GI gas/electric packaged unit. Not only will you get ultimate home comfort, but you can save money while getting both your heating and cooling needs met year-round in one unit.